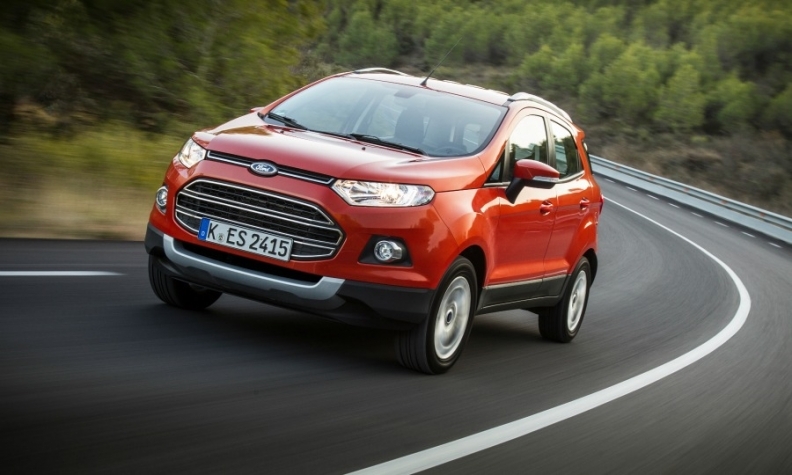 The EcoSport will launch a product offensive for Ford in Europe. MILAN -- Ford says its EcoSport small SUV could become one of the company's best-sellers in Europe if it receives enough product supply from India. Ford expects to receive about 30,000 EcoSports from India this year but foresees demand being much higher, Barb Samardzich, Ford of Europe chief operating officer told Automotive News Europe in an interview here. "The EcoSport has the potential to become one of our best-sellers in Europe and volume will grow over time as we expand the range with more powertrain and trim options," Samardzich said. Ford expects the Ecosport to help its bottom line because SUVs are not as heavily discounted in a European market whose price war has not eased despite seven straight months of sales increases. Samardzich said Ford continues to see very aggressive pricing on its existing models and new vehicles being introduced by rivals are also very aggressive positioned. But SUVs of all sizes are in high demand, which allows companies to sell the vehicles at a good price level, Samardzich said. At the same time, the growing demand for SUVs is adding extra price pressure on mainstream models of the same size. SUVs such as the Ford Kuga require lighter discounts than mainstream models such as the Focus, Samardzich said. "The success of small SUVs such as the EcoSport translates into higher discounts for mainstream subcompact hatchbacks," she said. European sales of the India-built EcoSport will begin in Germany in June, where the top spec Titanium model – the only model available at launch -- will start at 19,200 euros. Ford of Europe is in the midst of product changeover of its core products that will be completed by the end of next year. The face-lifted Focus, to go on sale in August, is Ford’s main new product this year. The Focus was Ford’s No. 2 best-selling model in Europe last year with 223,482 units, behind the Fiesta at 292,640, according to JATO Dynamics data. In the first quarter of next year, Ford will begin sales in Europe of the new Mondeo mid-sized sedan and wagon. The Mondeo's introduction was delayed by about 18 months due to a change of its manufacturing plant. The current Mondeo, together with the S-Max and Galaxy large minivans, are built in a factory in Genk, Belgium, that Ford will close by the end of the year. Beginning with the new Mondeo, production of Ford’s largest models for Europe will move to the company's Valencia plant, Spain. After the new Mondeo, Valencia will build the second-generation S-Max, which will on sale in the second quarter of 2015. In the first half of 2015, Ford will also begin European sales of the new Mustang. Europe will get the coupe and convertible at the same time. Samardzich declined to give any pricing or volume prediction for the first Mustang to be officially distributed in Europe by the Ford dealer network. In the second half of next year, Europe will get a second North America-sourced model: the Edge large SUV, which will be imported from Canada. For Europe, the Edge will also come with a diesel engine. In the first two months of the year, Ford sales in its 50-country European region that also includes Russia and Turkey, grew by 4.6 percent to 172,700, outpacing the 3.4 percent total industry growth. The Fiesta was Ford’s best-seller in Europe through February with 41,600 units, ahead of the Focus at 37,700 and the Kuga at 12,400, the company said.